Britain's new Foreign Secretary to make first official visit to the United States, discuss the fight against ISIS. New British Foreign Secretary Boris Johnson will on Thursday make his first official visit to the United States, meeting international counterparts as part of the fight against Islamic State (ISIS), AFP reported Monday. The former London mayor, a surprise choice to become Britain's top diplomat in new Prime Minister Theresa May's government, made his first overseas engagement on Monday, meeting with European leaders, many of whom were angered by his campaign to take Britain out of the European Union. Johnson will meet with his American counterpart, Secretary of State John Kerry. in London on Tuesday to "underline the importance of the special relationship following Britain's decision to withdraw from the European Union". He will then host a meeting of counterparts from Germany, France and Italy, and the EU High Representative to discuss the conflict in Syria, according to AFP. "The session will focus on the fragile Cessation of Hostilities, the dire humanitarian situation, and the conditions needed for parties to resume UN-backed talks," said a statement issued by the Foreign Office. Johnson and Kerry will also meet with foreign ministers from Saudi Arabia and the United Arab Emirates (UAE) to discuss the conflict in Yemen. "We must be more active, more engaged and more outward-looking, so I am delighted to have this early opportunity to welcome my international counterparts to London for important meetings on the conflicts in Syria and Yemen," said Johnson. "I will be making clear my view that the suffering of the Syrian people will not end while Assad remains in power. The international community, including Russia, must be united on this," he added. Johnson, who was first elected as Mayor of London in 2008, was viewed as a top candidate to replace former Prime Minister David Cameron, who resigned following the Brexit vote, but ultimately decided not to run for the position. Johnson is known for his pro-Israel stances. In late 2015, he visited Tel Aviv, where he blasted boycotters of Israel. 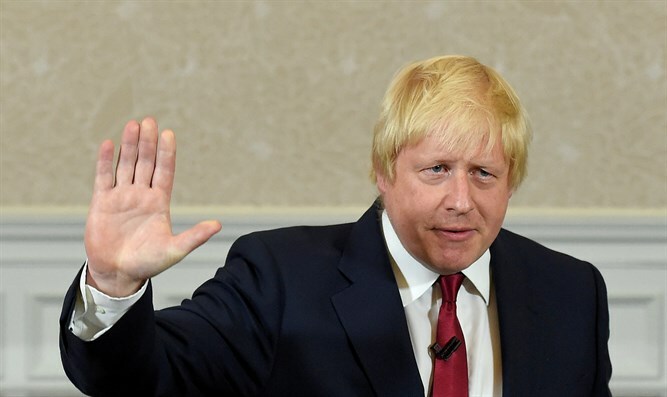 In 2012, Johnson expressed his support for a moment of silence at the London Olympics to remember the Munich Massacre of 12 Israeli athletes, even after the International Olympic Committee rejected the idea. And, several months ago, he rapidly acted at the request of MK Yair Lapid (Yesh Atid) to remove an anti-Israel campaign targeting London's underground system.